Long before plug-in hybrids or electric rocket sleds like the Tesla were the talk, a smaller and much faster plug-in was available for use by kids not even old enough to drive. Hot Wheels Sizzlers relied not on sponge rubber wheeled launching devices or setting up 20 feet of orange track on the staircase for velocity. Sizzlers were powered by wee electric motors and on-board rechargeable batteries. A minute or so of charging with the Juice Machine and the cars barrel-assed around the track for up to five minutes. As the Sizzlers were not confined to slots or lanes racing action held SUPER PASSING POTENTIAL! The good news? 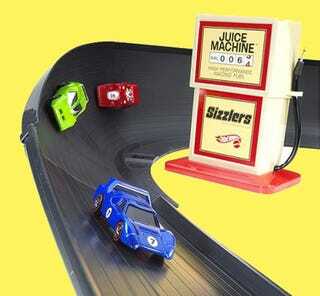 Hot Wheels has re-issued Sizzlers and Sizzler accessories. Now go buy four sets and make a wicked huge track. At 25 bucks a set you can't lose. Lap counter may be sold separately.